We have an annual tradition. Every year on the day of our local Santa Claus parade, the boys and I (and hubby if he is home) head to my brothers for breakfast in the morning, and then we bundle up and head outside to watch the parade. We are so lucky that they actually live ON the parade route. We just have to walk out to the end of the driveway. November is here and the Santa parades will be happening soon, so I decided to put together a list of local ones that you might enjoy. I have never been to a night time parade before; I think it would be really neat to see all the lights. Timing just hasn't worked out for us, but we do always make our local parade where Santa is brought in on a fire truck! 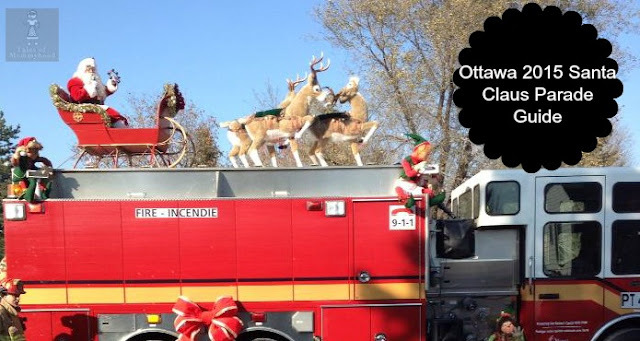 Do you attend a Santa Claus parade in your area? If you do, remember that most of them collect non-perishables for the local food bank - so try and have a donation with you to contribute! If you are looking to find out the Mall Santa hours at the local malls, my friend Stacey at Not Just Baby Brain has rounded them up! Just moved to a new province and I'm thinking of attending the parade in my area; it's an evening parade so I'm guessing there will be a lot of lights! Great list! I think ours is happening here in Victoria next week! We can't wait to go with our grandchildren! I love the parades and brought my littles to their first one this year!